When you make an investment in new windows or doors here in the Pacific Northwest, you want to be sure you receive expert, professional installation for an exact fit with no hassles. That’s why N.W. Siding and Windows employs certified Installation Masters™ to ensure quality craftsmanship at your home. Installation Masters™ is a nationwide training and certification program, prompted by the Building Environment and Thermal Envelope Council (BETEC) through the U.S. Department of Energy (DOE) and developed by the American Architectural Manufacturers Association (AAMA). This program provides specialized training to new construction and replacement installers of windows and exterior glass doors. It is designed to teach installers the best practices and installation techniques based on established industry standards. An Installation Masters certification provides homeowners assurance that an installer participated in rigorous training and passed a written test. Choosing N.W. Siding and Windows to do any type of renovation on your home is an important decision. To aid you in you evaluation of potential window companies, we describe the four basic installation methods below. Each has its advantages and limitations. This knowledge will empower you to evaluate potential companies, and recognize those who cut corners. The installer removes the old window and cuts the siding back approximately 1/2″ – 1″ around the frame. This allows the factory flange, which fastens the window and helps to keep it watertight, to be left on the window during the installation process (just like in new construction). The flange aligns the window on the framing to ensure it is properly supported. The window is then trimmed, sealed and caulked. This is the best method for installing windows in wood siding. Installers use this method in situations where the original window frame should be left intact, for example, an old wood double hung window in a brick home. New windows install in much the same fashion as the sash portions of the original windows. They sit securely inside the existing wood frames. This method may be preferred for historical or aesthetic reasons. There is no fin on windows installed in this manner. However, the existing frame supports the new window and ensures a weather tight fit. There are five basic elements to window selection. Let N.W. Siding and Windows project specialists visit you and guide you through the five-steps to choosing the windows just right for your Pacific Northwest home. Frame style – We will discuss with you the frame that is right for your environment and style: Aluminum, fiberglass, woodclad, or tradition hardwood. Styles and configuration – A variety of window styles exist – including one that is the perfect look for your home. Also consider optional grids to add a distinctive look. Glass and technologies – Our project specialists can show you how to reduce your energy bills, the sun’s heat, and harmful UV rays by choosing quality glass. Hardware Options – Window hardware can be tailored for each of our window systems. You select a design that is ideal for you. Our hardware always meets or exceeds very strict “forced-entry” codes to provide your family with a new measure of safety and security. Windows 101 – Why Invest In Windows? Replacing windows and doors is one of the most popular home improvement projects in the Portland, Oregon metro area, and for good reason. It produces dramatic results from a modest investment, no other element impacts a room’s feel as dramatically as its windows. They frame nature’s light and add a distinctive personality to each room. New Windows update your home and increase street appeal. Here are the most popular reasons for replacing your windows. New windows with high tech coatings keep you cool even on the hottest days. Low-E squared glass reduce heat gain by more than 60%! They protect furniture and drapes against fading by blocking out harmful UV rays. New windows stop cold drafts and reduce moisture with a new weather-tight fit. They eliminate the mold and mildew associated with ill-fitting windows. Your family will be more comfortable and you’ll enjoy lower heating bills. Windows account for approximately one-third of your home’s total heat loss. So, it’s important your windows perform well. NW Siding and Windows helps you to increase your home’s energy efficiency by providing Energy Star program certified windows. They’re over 40% more energy efficient than required under most building codes, so you’ll save money year after year. A report published by Cardinal glass estimated that a typical 2500 square foot home would achieve up to $324.00 in annual heating bill savings by installing new high performance windows with Low-E2 glass. New windows impact a room’s look and feel like no other element. New windows and doors also beautify the outside of your home – in fact they can give an outdated exterior a vibrant new look. Personalize the look of your home with a new Bay window or French doors. The possibilities are endless. A new dual-pane window with either multi-point locks or new sturdy cam locks, will no longer be an easy point of entry. Homeowners have discovered that new double pane units with “dead” air space reduce noise significantly. Stop fighting with windows that won’t open or doors that stick. Properly installed new patio doors will open with one finger and windows are just as easy. First, don’t be confused by the claims of different manufacturers. The National Fenestration Rating Council (NFRC) is a non-profit independent program that assures windows displaying the NFRC label provide unbiased energy efficiency ratings. The NFRC label helps you compare windows in the same way you would compare MPG on automobile stickers. The NFRC sticker rates the windows as a whole unit, including the glass, frame and weather-stripping. The U-Value is a measure of heat loss through the window. Look for a low U-Value, meaning the window will allow a very low amount of your home’s heat to pass through to the outside. An excellent U Value would be in the .26 – .34. Our February 2009 Stimulus package rebate requires a .30 U-Value. The R-Value measures how well a window holds heat back, or resists heat loss. R-Value may sound familiar – it is also used to describe the insulation in your attics or walls. You’ll want a high R-Value for best performance. This means the window holds in most of your heat. An excellent R-Values would be 2.40 – 3.00. The glass in two windows may look the same, but perform very differently. Make sure you choose a high quality glass that offers you more comfort, lower utility bills and protect furniture and drapes. Super spacer is the glazing that is needed in the window to archive a low U-Value rating. Low-E, the abbreviation for low emissive glass, has an invisible, microscopic, metallic coating that admits the full spectrum of sunlight but blocks radiant heat from escaping. During the winter months, between 70 and 75 percent of the heat that would otherwise escape from the house reflects back into the home. During the cooling season, as much as 25 percent of the unwanted heat that would otherwise enter the house is reflected to the outside. And the low-E coating helps to block ultraviolet light that can fade fabrics and furniture. Exterior condensation usually isn’t anything to worry about. Dew on windows is a natural atmospheric phenomenon, and it doesn’t mean your windows are leaking air or malfunctioning in any way. 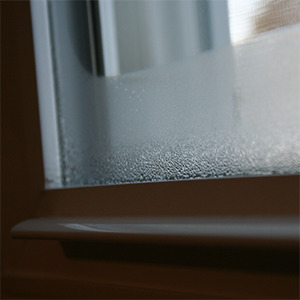 In fact, exterior condensation is a sign of energy efficiency, since it means the outside pane is thoroughly insulated from the heat indoors. Depending on where you live, it may occur just a handful of times per season. To clean your glass, use mild soap mixed in water. Rinse with clean water. Use a soft cloth for washing and drying to avoid scratching. (Petroleum based, abrasive, or caustic cleaners will cause damage to your glass.) Razor blades and other metal objects should NOT be used on your glass. The use of mild soapy water with a soft brush will be adequate to clean the screens. Lightly dry them with a soft cloth, or air dry to avoid stretching and tearing. Never use any chemicals on your screens. To clean the window sills and door tracks, use a soft brush to loosen dirt and debris, then remove with the crevice tool on your vacuum. This will allow the window or door to perform properly. To lubricate the working parts of your doors and windows, use a silicone spray (Oil based lubricants are not recommended). Wipe off any excess silicone. Areas with high salt or extreme weather conditions may require more frequent application of the silicone lubricant. Our windows are designed to allow water to flow to the outside. Because of this, weep holes need to be kept clear and open. It is normal to get small amounts of water in your sill or track, but excessive amounts indicate the need for maintenance of the weep holes.